you should sell theses I would pay $20 for 5 of them. I’ve seen christian tracts with there lies published on them and believe this type of evangelistic material would be great! Think about it! When you keep praying to a dead gawd that never delivers on any of his promises and yet you keep giving your money to the local church finding even a dollar bill or something that looks like money they might get them so excited that they will get a chance to read about the one and only true living God that not only delivers on all his promises but asks nothing in return. Praise his holy name Ramen!!!!! I wish I could help monetarily with an endeavor like this but because my good christian wife ran off with all my money and find myself broke at this time I can’t but thanks to his noodly goodness I will recover and and materials like this would be something I will seek out in the future. If it’s not too much to ask please send me info and as soon as posible I will be using tracts to spread his word. Thank you in advance. Have a saucy day! I know that some god botherers in America leave what appear to be dollar bills under plates in restaurants. They turn out to be religious quotes tarted up to look like money. It’s a bloody cruel trick to play on people who are continually working themselves ragged to earn a wage. i think this is a very funny way to spread the message. this is just extremely amazing. 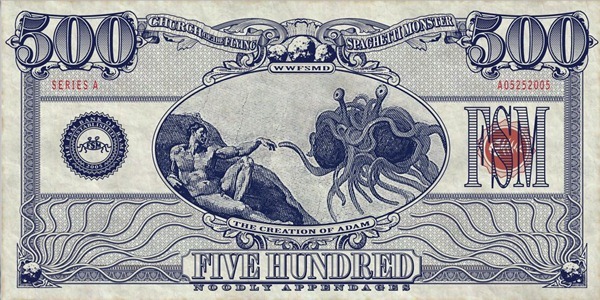 i recently became pastafarian and the fact that this religion exists restores my faith in humanity. kind of… ramen. Can you put them on Amazon or Ebay or something? Hiya! I just would like to give an enormous thumbs up for the great info you might have here on this post. I will be coming again to your blog for more soon.